by Robert Kozak* (Advanced Biofuels USA) The 2025 Corporate Average Fuel Economy (CAFE) standard of 54.5 miles/gallon has become a significant issue since the election of Donald Trump as president of the United States. Besides the Administration’s near religious fervor against Climate Change and the reduction of Green House Gases (GHG), the ability to meet the standard is also being negatively affected by the relatively low cost of vehicle fuel. If the gas pump cost of E10 fuel stays below $3.00/gallon, American consumers will likely assure that all major vehicle manufacturers, even Toyota which sold over 7 times as many SUVs (792,94) as Priuses (108,662) in 2017, will not be able to meet the 2025 CAFE standard. As an historical note, these purchases by US consumers are consistent with those in earlier decades. As long as fuel has been relatively cheap, Americans have always wanted big cars and trucks. In the 1960s, station wagons like the Ford Country Squire held sway in most suburban neighborhoods. And, how many years in a row has the Ford F150 been the best selling vehicle in the US? Looking from that perspective, how different is a 2017 Chevy Traverse SUV from a 1957 Chevy Nomad wagon? The Nomad had two doors, the Equinox four. So, is the turning away from small cars by the American public a bad thing for GHG reductions? Not necessarily. How can this be you ask? Because of the indirect and counter-productive way the Environmental Protection Agency (EPA) chose to measure and regulate motor vehicle CO2 emissions. Ever since the passage of the landmark 1970 Clean Air Act, Title II of the Act regulates pollutant emissions from all vehicles in a straight forward manner. A baseline exhaust emission of a specific pollutant; HC, CO, NOx for example, is measured in terms of grams/mile. As specified in the legislation, an emission standard would be some percentage of that baseline. For instance, if the Clean Air Act called for a 90 percent reduction and the baseline was 100 grams/mile, the standard would be 10 grams/mile for that pollutant. For the auto makers this meant every car and truck that EPA specified as needing to meet the standard had to meet the standard. There was no averaging between vehicles of different weights or with different engines. While these standards were seen by many as stringent, they were very efficient. Outside of LA, how many in the US have experienced an ozone violation in this century? Two additional important aspects of EPA automotive emission standards need to be pointed out. First, EPA never specified what technology the auto makers were required to use. Catalytic converters, fuel injection, and on-board computers were selected by manufacturers because of their efficiency and cost-effectiveness; not by EPA. Second, EPA used the regulatory power given it by the Clean Air Act to require fuel manufacturers to modify their fuels to assure that the health benefits of the pollution control systems would be delivered. The most important of these fuel changes was the switch to non-leaded gasoline since the lead compounds in gasoline would quickly disable the catalytic converters. After the passage of the 1990 Clean Air Act amendments, another fuel change was required – the introduction of oxygenates to improve combustion. Initially, petroleum refiners used a petroleum additive, MTBE (Methyl Tertiary Butyl Ether), for this purpose. This compound, a persistent carcinogen, was soon found in water supplies near leaking fuel tanks. In order to stop the health hazard of MTBE while also retaining the low-emission benefits of oxygenates, ethanol was recognized by EPA as a safe effective compound and beginning in 2004 replaced MTBE in US gasoline. A 10 percent quantity of ethanol was the amount selected. When the Obama Administration proposed, and the Supreme Court accepted, that the Clean Air Act could be used to regulate CO2 emissions to produce health and safety benefits, most people associated with motor vehicle emission controls thought a similar approach would be applied. However, for reasons still not verified, but thought to be motivated by the Obama Administration’s emphasis on phasing out the internal combustion engine and phasing in electric vehicles, EPA chose another approach to regulate vehicle CO2 emissions – the Corporate Fuel Economy approach. When Presidents Nixon and Ford moved to reduce US reliance on Middle Eastern oil in the 1970s, the idea of regulating US gasoline use through vehicle mileage standards quickly gained traction. Besides the primary goal of reducing oil imports, the idea of using fuel economy standards to push American car makers toward the production of more efficient vehicles was seen as a way to help them compete with Japanese manufacturers. The recently introduced Honda Civic and other vehicles such as the revolutionary Datsun 510 were quickly becoming best sellers. After much haggling with the US vehicle manufacturers who were producing pick-ups and station wagons as well as smaller sedans, Congress passed legislation that allowed manufacturers to average the fuel economy standard over all vehicles produced. It was called the Corporate Average Fuel Economy (CAFE) Standard. Simply put, manufacturers did not have to meet the standard with any vehicles. Instead, the mileage of the end of the year sales figures had to average out at the standard or better. As you can guess, the system was easily gamed. If you’re running above the average, move the December low-mileage trucks into next year. If you’re running below the standard, save the late year sales of high mileage cars for next year. Just in case. Many in the vehicle industry could not believe that the Obama Administration was changing emission regulations for CO2 from the successful grams/mile, no EPA restrictions on technology approach to the CAFE approach. In addition to the averaging approach, EPA also made two important technology restricting decisions. First, by limiting the calculation of CO2 emissions to only those from the tailpipe for electric vehicles, rather than including life-cycle emissions that are required for biofuel pathway approval, electric vehicles were suddenly “Zero CO2 Emissions” even if their electricity was produced by non-renewable high GHG sources such as coal. Second, EPA moved to stop vehicle manufacturers from using higher ethanol content fuels to reduce CO2 emissions, including E85 that manufacturers were building “Flex-Fuel” vehicles to use. 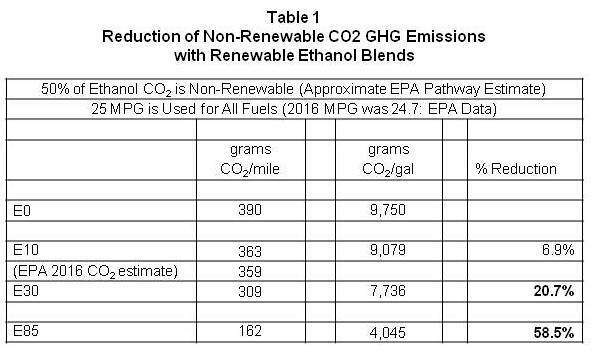 EPA did this by changing certification calculation variables such as the “R” factor to eliminate the well documented non-renewable GHG CO2 reductions available from renewable fuels such as ethanol. The result was that EPA no longer differentiated between non-renewable CO2 increasing GHG emissions and renewable CO2 emissions that did not increase GHGs. This left only two EPA-required ways to reduce CO2 GHG emissions. One, expect the minimal yearly GHG CO2 reductions from new better mileage vehicles to add up over time. The slow rate of this change is seen in EPA data. A 28 percent improvement has been estimated from 2004 to 2017. At this 2.2 percent annually, a fifty percent improvement would take nearly 25 years. Two, purchase electric vehicles (with $7,500 tax credits) and count the zero GHG CO2 emissions while ignoring the GHGs produced from electrical production and transmission. This brings us to where we are now in the winter of 2018. Increased sales of SUVs are stalling GHG CO2 reductions and electric/hybrid vehicle sales remain at about 5 percent of total vehicle sales. As hard as it might be to believe, this unfortunate transportation GHG situation can be overcome quickly and fairly simply. Here’s how. Keep the motor vehicle CO2 reduction goals in place. Get rid of the CAFE regulatory approach and EPA restrictions on technologies. Use the existing gram/mile approach to measure and regulate various vehicle classes. Restore renewable fuel GHG reduction variables in fuel efficiency calculations. Use higher ethanol and other renewable fuel blends to reduce non-renewable GHG CO2 emissions instead of more expensive vehicle weight reduction strategies. In the following table, potential reductions in non-renewable CO2 GHG emissions are shown for the current generation of renewable ethanol production. These fuels reduce the amount of GHG CO2, as compared to gasoline, by up to 50 percent. As shown, E30, a blend identified as bringing both performance and improved mileage, could immediately offer a 20 percent improvement, even if mileage was not improved. As for E85, a 58 percent improvement would be available. The increased demand for these higher blends would draw investment to the renewable biofuel industry. Higher yield crops and more efficient conversion systems would push the reduction of GHG CO2 even higher. Reductions over gasoline, not including improved fuel mileage, could reach up to 80 percent in a decade. This would be a significant improvement over the 22 percent available from the current CAFE approach in the same time frame. Much can be done to quickly increase the use of these E30 and E85 mixtures in current vehicles, as well. Manufacturers of E30 and E85 “capable” vehicles could offer warranty backed retro-fits to maximize the use of the fuels in those vehicles. In our part of the country (Maryland), 93 octane premium gasoline is about $3.25/gallon. But E85, which has even higher octane than 93, is about $2.30. Tuners with high performance engines already know this and use E85 to maximize the performance of their turbocharged cars. I think the Navigator owners will also soon find out and wonder why they can’t save about $1.00/gallon as well. And so, if anyone asks what will be the economic incentive for a revised, more effective CO2 GHG reduction plan that uses renewable fuels as well as technology, tell them this. Renewable ethanol is about $1.00/gallon cheaper than high octane gasoline. It’s the cheapest way to produce the octane, performance, and efficiency people want. With GHG reductions coming from renewable fuels, expensive light weight carbon fiber won’t be needed to reduce vehicle weight to improve mileage. Cars and trucks will be cheaper. *Robert E. (Bob) Kozak is the founder of Atlantic Biomass, LLC, and a co-founder of Advanced Biofuels USA. Having worked for about 40 years in the transportation, energy, environmental, and government relations industries and in enzyme development, he serves as a fuels/engines and policy expert for Advanced Biofuels USA. He can be reached at atlanticbiomass @ aol.com The views expresssed here are his own and do not necessarily reflect the opinions or positions of Advanced Biofuels USA or its board.